The four women body types are each completely different. They crave different types of foods. They have different personality traits. Different body shapes, etc. You can start to follow your personalized body type diet and lose weight easily. What happens is that often one of the four glands that we distinguish is over working and the others are weaker, trying to catch up. When you eat right for your type you allow the gland that is over working to rest and you boost up the other glands. Ok, so let's look at each of the women body types at a glance and get a brief overview of each female body type. Please Note: It is not always possible to determine a body type by looking at the body shape. As a Naturopath I have had many tall slim clients come to see me whom I thought were Thyroid types. When I did a complete evaluation, I found out that was not the case. If you are still trying to figure out, "What is my body type?" I have a complete questionnaire. 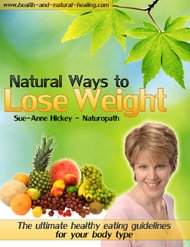 This comes with my simple program, Natural Ways To Lose Weight. which helps you determine your type and learn how to eat right for your body type. I encourage you to click here to learn how to nourish your body with the right types of foods at the right time to lose weight, increase energy and feel more balanced.